Headwaters’ leading restaurant for simple & authentic Italian food. 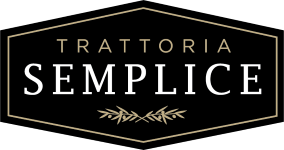 Both charmingly rustic and equally sophisticated, Trattoria Semplice captures the true essence of Italy in the heart of Orangeville. Elegant atmosphere, illuminating tea lights, and decorative antiques are just some of the stunning features you’ll see here. In the warmer weather, guests can be seated outside and sample cocktails on the patio, or enjoy the light entertainment provided by some of the town’s most talented musicians. Using only the freshest ingredients, Trattoria Semplice offers a sophisticated menu of simple classics and traditional creations, based on fresh produce, hearty pasta, and delicious local wine and beer. Behind the scenes, Alfredo Ferrante, featured in The Hills Magazine, leads the kitchen creating all pasta from scratch as he has been for the last 50 years. We also have daily specials, each taking inspiration from different regions of Italy.